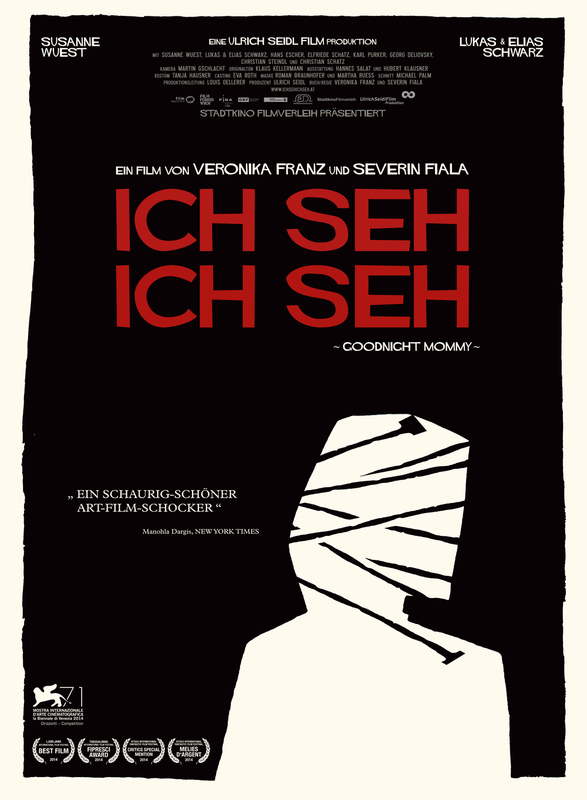 Ich seh, Ich seh (English title: Goodnight Mommy). 2015. Written & Directed by Severin Fiala & Veronika Franz. Starring Susanne Wuest, Elias Schwarz, and Lukas Schwarz. Ulrich Seidl Film Produktion GmbH. Rated R. 99 minutes. This is a film I’ve anticipated ever since first hearing the premise. Almost had sort of a fairytale-like feel to it. Finally getting a lucky chance, I was able to experience this dark and dreamy feature film. Goodnight Mommy, a superb Austrian film, indeed has atmosphere like that of a fairytale story. Within a horror there is a deep family drama – two boys against their mother, or whoever might have taken her place. Surprising me at nearly every turn, Goodnight Mommy has the ability to shock, but the script is wonderfully complex and the characters just as strong. While I say that it can shock, I don’t mean that it’s an “arthouse shocker” as it is described on the poster. I think that’s a bit of a misleading label. There’s nothing arthouse about this one. That being said, there are plenty of surrealist moments present throughout, as well as a ton of horror imagery. But I think by calling it arthouse that not only misleads audiences, it also misrepresents this film overall. There is both psychology and horror at play in Goodnight Mommy, and it just so happens there is plenty of atmosphere and style in heaping portions, which helps everything else along quite nicely. The movie starts as two twins, Elias and Lukas (played by twins Elias and Lukas Schwarz), are about to see their mother home for the first time since her cosmetic surgery. Out from the darkness of her room comes their mother (Susanne Wuest) bandaged beyond recognition, bits of her swollen face showing puffy through the wraps here and there. However, she doesn’t seem to them to be the same mother she always was, and there is something very much Other about whoever this woman might be. As we twist and turn through the dreamy world of directors/writers Severian Fiala and Veronika Franz, the twin brothers plunge into a world this mother – or Other – and the darkness surrounds them all, leading to a shocking and most horrifying conclusion. The two male siblings are like inseparable twins out of folklore tales. Introduced into their world is a mother whose face is unrecognizable – at least in the beginning – which begins the film’s exploration of identity, attachment, trust, and truth. Right away the family plays a game – everyone takes turns putting a sticky note on their forehead & trying to guess who they are – which automatically seems to set the two boys in stark opposition with their mother. As if she isn’t even their mother at all, but an impostor. I thought the scene was surprisingly tense for such an early juncture. There’s an excellent tone from the start, as we’re thrown into a family dynamic which was obviously a little flawed to begin with. However, even before the boys somewhat confirm any supspicions there’s a feeling that something is out of place. Everything feels a bit strange. Helps cultivate a nice mood of dread. I love when a film can throw me off and subvert my expectations. Around every corner of each frame, it feels as if there lurks the unimaginable. We move along in a feverish dream state, just as the boys seem to; caught between sleep and reality. The boys, outside and free, feel in the land of the living. Their mother looks to be stuck in a nightmare, locked in her room and gazing at her new self in the mirror. The juxtaposition of the darkness versus the light in Goodnight Mommy is astounding and works perfectly. In the world of those shadows, the boys’ bandaged and Other-ish mother is Queen. Outside in the fresh air and the light, the boys are happy and safe. Inside with their mother and the darkness, the air is threatening. Then comes a beautifully twisted scene in the form of an actual dream. Highly creepy. It involves the mother in the woods; don’t want to say much more, you must see it for yourself. There are several macabre and wonderful dream sequences, spooky bits. What I enjoy so much is that at times it’s tough to initially distinguish between the genuine dreams and the dream-like atmosphere of the film’s reality. To say any more about the film’s plot would be to do it/anyone reading a disservice. I’d not expected all that came out of Goodnight Mommy, when so much intense and wild stuff did I found not knowing much of anything heading in made the experience much richer. There’s a lot happening here and it isn’t simply a bit of shocking horror, there’s real substance. Above all else, Goodnight Mommy has the earmarks of pure existential horror. What starts as a worry their mother has changed because of her cosmetic surgery becomes, for her sons, an existentialist struggle when they feel under threat. The final 30 minutes are certainly disturbing, intense, and downright horrific at times. From a dream-like state we are brought abruptly, raw into a bright and realistic world now where the boys are King, instead of the shadows where they near cowered earlier. I thought that’s one of the biggest strengths of the film. It reminds a bit of Proxy, which in turn reminded me of Psycho, in terms of how the story’s structure and focus almost seems to realign itself over the course of the film. With Goodnight Mommy, we start in one perspective, but by the last half hour we’re ready to switch over to the other side. By the film’s finish, this is a truly effective method which the directors used and I think it ultimately paid off. Some might believe the end twist is foreseeable. Honestly, I never once saw it coming. Masterful storytelling. While it’s a similar ending to other films we’ve seen, the end is justified by its means. You watch and get sucked into everything that’s going on, then the climax crashes down on top of you. The journey is what it’s all about – the end simply hammers home the psychological reality of all the horror happening surrounding the boys and their mother. Acting is fantastic, from the boys, as well as the mother. Especially in the first half of the movie, I thought both Elias Schwarz and Lukas Schwarz did a wonderful job as the confused and fearful twins. They really did great work here, as you can feel the bond between them while also seeing how lost in a confused haze they’re becoming, not sure if their mother came home or if this person really is some Other. This is the only film these two kids have ever done, as far as I know, so that’s something else pretty amazing. I’ve seen reviews say their performances were flat, however, I don’t see it that way. Certainly once the ending hits you, the retrospective look at their characters provides enough to understand why the boys are the way they are. So give it time, they’ll grow on you and get you by the finale. Even more so, Susanne Wuest is absolutely unbelievable in Goodnight Mommy. Her role, as well as those of the boys, twists and turns. At times, mostly at first, you’re never sure where her character will go. By the middle and a little further, you’re pretty sure; even if you’re not, the results are terrifying. She did a lot of excellent stuff while her face was bandaged, but definitely once they’re off she pulls out an emotional, intense performance to match the plot’s own intensity tenfold. Hands down, a 5 star drama-horror with some surreal elements. I’d waited so long to finally see this and it was well worth the wait. Cannot wait until this gets a wider release, as well as a nice Blu ray. I’ll be snatching that up as quick as humanly possible. When I get the chance to see this again, it would be great to examine it more at length, see it a couple times. It’s that great a film. Again, some say the ending is like “all the others”, and in a way it is, but the entire thing is so refreshingly inventive and interesting that it makes the entire journey worth it. An incredible ride, all on “glorious 35mm” as it says in the end of the credits. See this once you can and enjoy every last mortifying second.